The second edition of this book has been fully updated to include information on optical sensors launched since 2012 and on new developments in technology, particularly on small satellites and on constellations. There is also a new chapter on applications which looks at how products from optical sensors are used by various organisations for the benefit of end users. Information is given on acquiring images and value added products. Examples and case studies from various disciplines and regions are included. The book explains to students, anyone working in map production and scientists working in fields other than mapping, the way in which high resolution imagery is obtained and the issues which surround its collection and use. It deals progressively with the fundamentals of mapping from imagery, followed by the key features in the design of sensors and methods of data storage and transmission, including data compression. Subsequent chapters cover the sensors, calibration, sensor models and the methods of determining the orientation elements and extracting coordinates from the images. Rigorous orientation, use of rational polynomial coefficients (RPCs) and approximate methods are covered. Results from tests showing the accuracy which can be obtained, generation of digital elevations models, their accuracy and the production of orthoimages are included, as are image processing and data fusion. Finally, future missions and the issues which face further development are discussed. 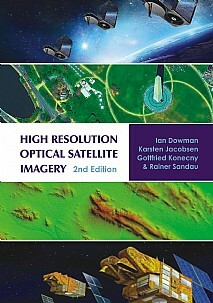 High Resolution Optical Satellite Imagery is written by a team of acknowledged international experts, is the only comprehensive text on the subject and has been well received by the geospatial community. A key text for advanced students, academics, researchers and practitioners in geomatics in general and remote sensing and photogrammetry in particular. It will also be a useful reference for scientists and engineers in other disciplines who use satellite imagery.